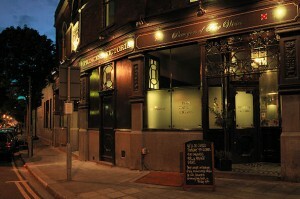 This is an original Victorian pub recently converted and which re-opened in June 2008. Pubs aren't generally smart but the Princess Victoria is clean and relaxed – in keeping with its intention of preserving the ethos of a public house. Wooden floors, black leather banquette seating and an ill-matched assortment of old wooden tables and chairs. Good looking menu, which has the commitment of the chef as he is a partner in the enterprise. Whilst beers are offered on tap the wine list is one of the most extensive I've seen. It draws on regions from around the world. There are over 20 specially selected wines by the glass, including sherries and Champagne and Prosecco, meaning you can order them in a variety of carafe sizes ­ – why don't more places offer this? The wines are grouped according to price (not region or variety)­ – helpful if you're on a budget. Maximum prices are around £50, with a reserve list which goes much higher. They also have an extensive spirit collection. Their bar snacks are imaginative: Potted Dorset crab, green bean and endive salad, Melba toast , Ceviche of salmon, ginger, chilli, coriander cress and lotus root crisps, Terrine of confit rabbit, ham and pickled carrot, soused cucumber and brioche, the Pork board: Gloucester Old Spot pork and pistachio pâté, confit pork belly, Bayonne ham, crispy fried pig’s cheek, scratchings and piccalilli. Main courses are reasonably priced with a wide choice. PV splits its wine list into two with the most special bottles appearing in their Reserve list. Here, for example, you can find a Champagne Dom Perignon, 1999 at £ 99.00, in itself worth taking a cab ride across London for, or Krug Grande Cuvée NV, pretty fair value at £120.00. Included in this list are their top Rieslings, Pinot Noir such as Felton Road (New Zealand) and their finest Pinot Noirs from France, Austria and Germany. Definitely a place for the wine enthusaiast and especially for those who love Riesling and Pinot Noir. Their lunchtime menu is available as 2 courses £12.50 or three £15. Seating for 70-100 people. You can buy any of the wines off their list for 50% off the bar price. A gastro pub with a twist, or should one say “a lot of bottle”? Hours: 1130-2400hrs 7 days/week. Booking advisable. The website is packed with information, see the link below.